Apartment in Palermo Hollywood, Buenos Aires - Costa Loft ! Extra spacious 810 square feet duplex loft with private terrace in upmarket apartment building in Palermo Hollywood. 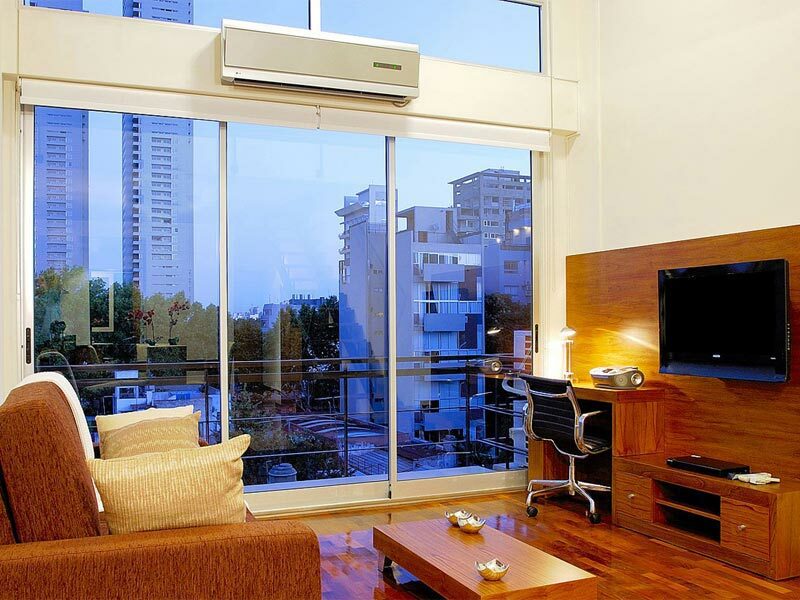 This one bedroom duplex apartment for rent in Buenos Aires will satisfy the needs of the most intrepid traveller. With 75 square meters of living space, this loft is bright and light, thanks to the double height floor to ceiling windows, which open onto your own private terrace with barbeque. The open plan kitchen is located on the ground floor of this apartment, well equipped and ready to go, with everything you may need to conjure up a romantic meal for two. The living room which adjoins the kitchen looks out over the private terrace and benefits from a barbeque area. On the first floor of this duplex you will find the master bedroom with king size bed and connected to its own private bathroom. This modern, high end building benefits from 24 hour security, rooftop terrace with hot tub, and with its unrivalled location in the heart of Palermo Hollywood makes this a great property to base yourself in.